Designed and built in house by Curtis Technology, this CPCI card links the 2031CT DSP Processor to the Sonar 2031 Terminal Unit or to a digital array. The TAXI interface card receives a serial digital data stream via the front panel connector. It then converts the data back into the data word format required for processing by the BCVP card. 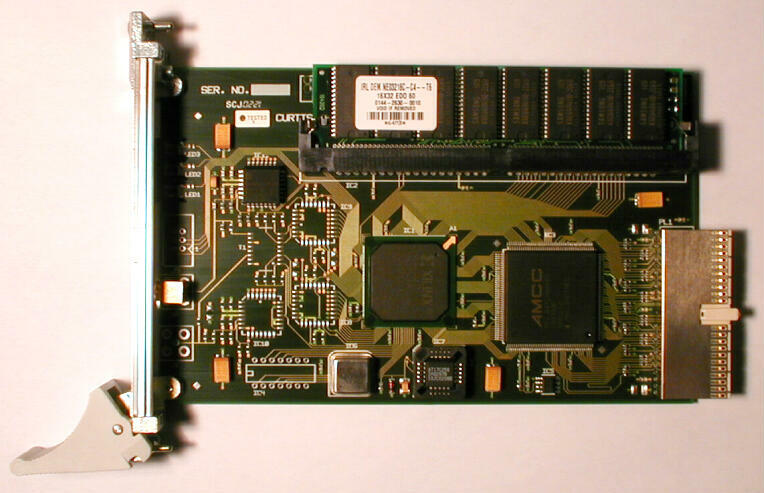 The TAXI interface card has a 64MB DRAM store which can hold the last 16 seconds of received data. In an ideal world, a much smaller data store is required. The BCVP processes each channel of data every 500 millisecond, so the TAXI interface card need only hold this amount of history data. In practice, the NT4 Operating System (which is not a true real-time OS) places a number of unknowns in the processing timing and could, in a worst case situation, spend several seconds performing non DSP tasks (re-calibrating hard disks, writing to slow peripherals etc). To overcome this, the TAXI interface card will simply build up to 16 seconds of history data when the OS is busy elsewhere, and catch up on the processing when CPU time is available to it. The stored history data is read by the BCVP card , which performs the processing of the stored data. The TAXI Interface card can support multiple Hotlink and/or TAXI interface connections. For compatibility with Sonar 2031, Curtis Technology have fitted one TAXI interface connector to the card.